How To Do a Smoky Eye Palette With Korean Products! Many women love the look of a smoky eye, but some don’t know where to even begin to get the perfect smoky eye for themselves. Start any smoky eye by selecting a smoky eye palette, eye primer and lengthening mascara. The ideal selection of colors will be shades in either blacks, greys, or browns and choose one light highlighting color. Liberally apply a small amount of eye primer and then use an eyeshadow brush to gently pat the primer evenly all over the eyelid and up to the base of the eye brow. Banila co primer is an excellent choice of product for eye makeup primer, with smooth lasting color payoff. To begin with the smoky eyeshadows take the color that is slightly lighter than the darkest eyeshadow you selected. Use a soft eyeshadow brush to sweep this shade all over the eyelid and slightly above the eyelid’s crease. You can use the recommended 3 Concept Eyes eyeshadow which have perfect smoky eye palettes to choose from. Use a firmer eyeshadow brush to sweep the darkest smoky eye shadow you chose onto your eyelid crease and perhaps slightly above it as well. Also gently sweep this darkest shade on your upper and lower lash lines to thinly line the eyes. The last color you will apply is the light color that is slightly lighter than your skin tone. Apply this under your brow arch and use it to blend the outline of the darkest smoky eyeshadow to make it appear softer. The best bet for mascara to get the maximum smoky eye effect is to select a lengthening mascara in the color black. Use an eye lash curler to curl the lashes to really make them stand out. Hold the curler on them for about thirty seconds to one minute. Instead of sweeping on the mascara in the direction of how the eye lashes grow, sweep it on in the opposite direction which will make the eyelashes really stand out and be noticeable. While it is an optional choice to apply a highlight under the eye it really does help make the smoky eye look fantastic and even more beautiful. Find a concealer or foundation shade that’s one tone lighter than your natural tone. Apply this under your eye in the area of the apple of your cheek and under eye area. Smooth this out with either a foundation sponge or a foundation brush. 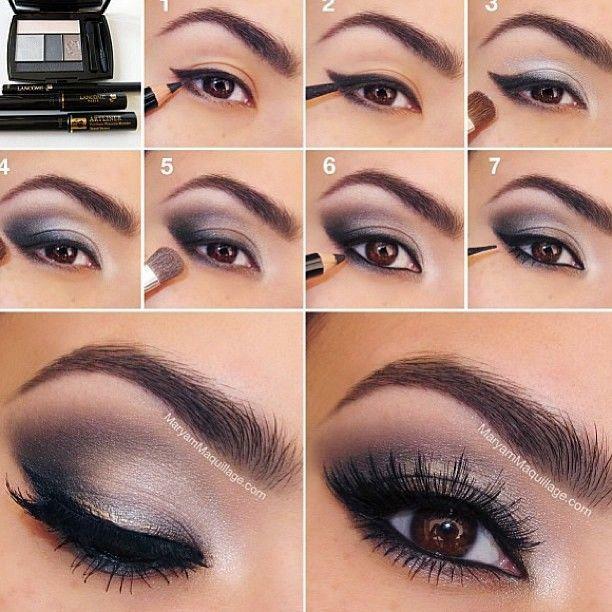 And now you should have your beautiful smoky eye!